BOXX Technologies continues to innovate high-performance computer workstations, rendering systems, and servers by equipping our workstations with the industry-leading NVIDIA Quadro RTX. The first Turing architecture-based GPU of its kind revolutionizes a new era for computer graphics professionals. This new architecture transforms the work of designers by giving them the ability to render photorealistic scenes in real time, advancing AI-based proficiency, and providing fluid interaction pertaining to complex models and scenes, BOXX brings this groundbreaking advancement to market months ahead of commodity workstation manufacturers. Impacting millions, the powerful, ahead-of-its-time capabilities of the NVIDIA Quadro RTX reimagines the workflow for graphics professionals. The new Turing-architecture has the ability to simulate the physical world in virtual reality systems 6X faster than its previous generation architecture, delivering greater hardware-accelerated ray-tracing for the first time. Ray-traced, photo-realistic details give designers and artists the ability to interact in real time with their complex designs and visual effects. Additionally, new improvements in AI-capabilities enhances advanced shading and simulation for creative professionals. 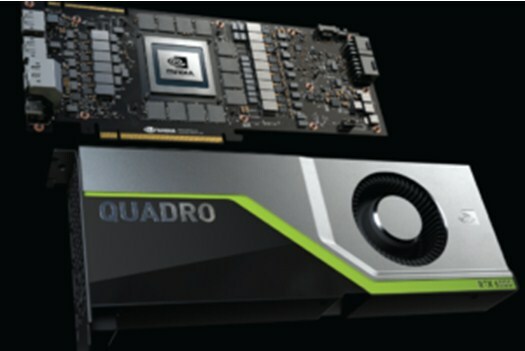 Building designs for the most exceptionally demanding visual computing workloads, the Quadro RTX provides new cutting-edge technology to industries such as film and video content creation, automotive and architectural design, and scientific visualization. Film, VFX, and animation studios now have the ability to recognize maximum throughput production rates while rendering their workloads. This innovative-improvement provides the opportunity to significantly reduce time and costs across a range of graphics specialties. The inclusion of NVIDIA’s new high-performance GPUs greatly reduces the processing time for animation rendering. What once could take hours will now be cut down to real-time rendering, providing unprecedented time-saving..
Real-time ray-tracing of objects and environments – new RT cores allow for real-time ray-tracing which enables physically accurate reflections, shadows, refractions, and illuminations. This vastly improves speed and precision of animation and virtual effects for media & entertainment industries. Improved support for real-world physics – up to 4,608 CUDA cores enable up to 16 trillion floating point operations and 16 trillion integer operations simultaneously. This allows for more accurate physics simulation for environmental conditions such as wind, rain, and snow. Enhanced performance of VR applications – New developments in programmable shading technologies has been implemented to improve the performance of complex visual, virtual, and graphics experiences. This allows for more realistic and authentic actuality in programs such as video games, virtual reality, and augmented reality. AI-enhanced rendering – Turing Tensor Cores provide up to 500 trillion Tensor operations per second to accelerate deep neural network training and inference. This advanced performance dramatically improves AI-enhanced features and capabilities such as denoising, resolution, scaling, and video re-timing. The inclusion of the NVIDIA Quadro RTX solidifies BOXX Technologies as the leader in workstation computer technology. Our unmatched innovation and development, as well as our strong partnership with NVIDIA and other technology providers, enable us to introduce revolutionary technology long before tier one commodity workstation providers. The unparalleled performance of the Turing-architecture based Quadro RTX GPUs unlocks infinite capabilities for creative experiences that were once unimaginable. Spearheading the movement for real-time ray-tracing, BOXX inclusion of the NVIDIA Quadro RTX allows designers and developers to interact and simulate with their creations like never before.